Hook’s is an interesting tale (that I know) … young bachelor, bottom of the totem pole, following after his pals and Steeldust’s band. Last spring – early, probably at least this time of year – I started to notice Ember and Pinon together, at the edge of the band, Hook always nearby. And then they were together – separate from the band. Shortly, Hannah joined them … then Sable. Both fillies – both yearlings – left their family band before their mothers had even had that year’s foals (Mahogany lost hers; Luna’s Gideon is quite robust). 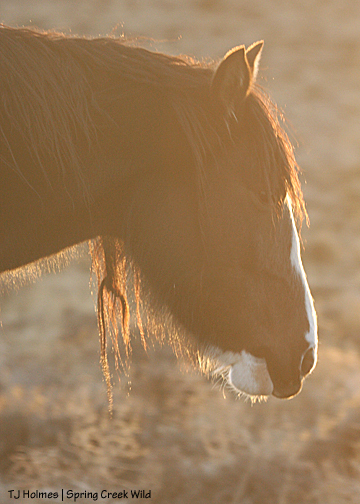 Hook is an admirable band stallion, much more cautious of me now that he has a family to protect … except that all these youngsters have known me since the day they were born (Sable) or soon after, and the mother of two of them (Luna, dam of Ember and Hannah) is the most patient and tolerant mare in the basin, and in fact, was the first to use me to shed her pesky stallion. So Hook keeps a watchful eye, and the girls and Pinon treat my presence as acceptable. 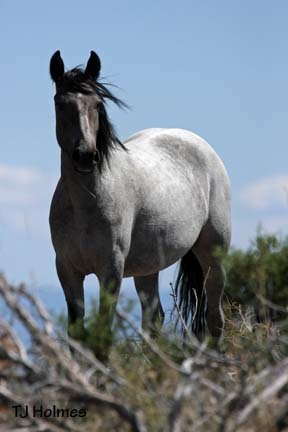 Ember had Fierro last July – already pregnant before she joined Hook’s band (likely sire, Mouse, though I can’t confirm). Shortly before Hannah left Steeldust’s band for Hook’s (sister Ember’s? ), she managed to “stray” into Hollywood’s band. I was visiting Bounce’s (the calendar’s April photo was taken during that visit) and watched the chaos while they ignored it all (or seemed to). Hannah was frantic to get back to her mother’s family; Holls was just as adamant that she stay with him. As young as she was (yearling), I knew what that meant … I don’t know how she ended up with Holls, and I don’t know how long she was with him – running the whole time I watched at least – half an hour? An hour? – but she made it back to mama Luna. Very shortly after that, as I remember, she was with Hook and his little band. And now what do you see in the photo above? Like her sister Ember, she’ll be a mama at 2. But Kestrel, who had Winona last year as a 3-year-old and elder sister of Ember and Hannah, kept her “condition” quiet until close before she foaled, so that’s just observation at this point. Normal? Symptom of our small herd size – which is bigger now? Coming-4-year-old Reya’s condition is unknown. 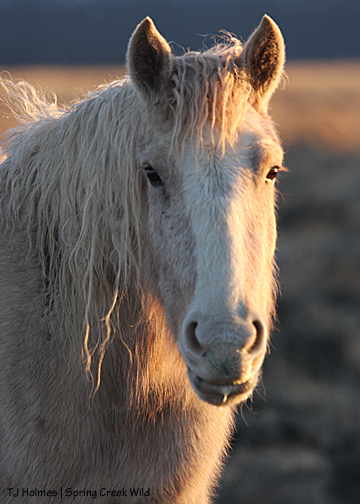 Her coming-3-year-old sister, Spook, lost her foal last year … Just something to make us go “hmm”? Baylee, Iya and Hollywood. I liked that I could see all their eyes. Bayles took another couple of steps that made an even better composition, but then she closed her eyes! How toasty warm he must be in that fuzzy coat! This one is meant to show a comparison between Iya’s and Baylee’s bellies … Round Top at right, Brumley Point straight back – Tenaz at far right. Brumley Point. 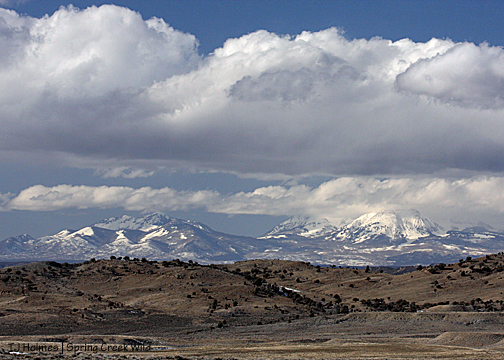 To get your bearings, McKenna Peak and the unnamed promontory are to the left. 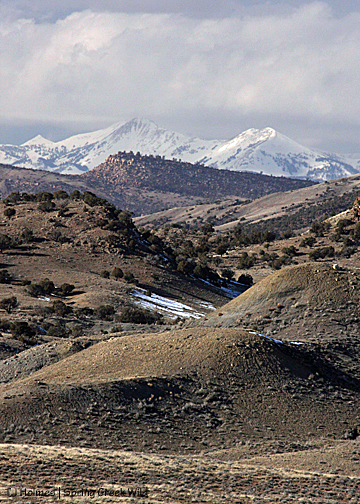 The far background rimrock hills are outside the herd area. Calm again. Holls and Bayles … love that light illuminating his eye! Another of my favorite images of the day. 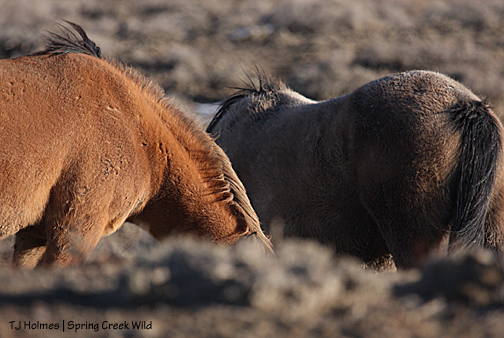 They are wild … sensitive to movement and sounds – and that darn mud made it hard to move in steady motion. Hollywood and Sage … I just liked their shapes in the sunlight. And bidding farewell when everything was back to calm. Love the little hitch to his nostril. I still had a decent trek to the Jeep, in the mud … I didn’t know at this point what was waiting for me at the bend … But I knew I was deliriously happy, right then, right in those splendid moments in the wild American outback. Give and take. Still and in motion. Light and shadow. Questions and wonder and mystery. How much will we know? How much do we want – need – to know? 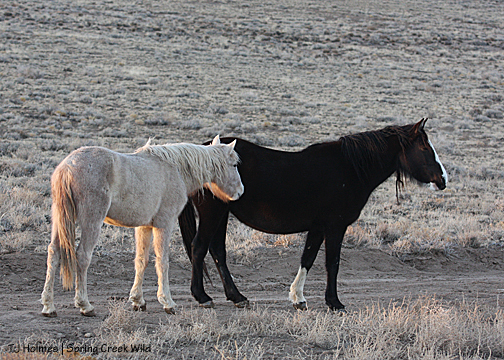 Winona peeking around Comanche’s tail. 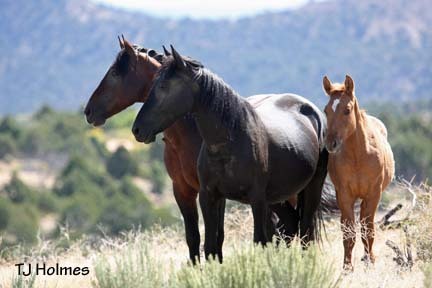 Comanche and ‘Nona and mama Kestrel. She loves her mama Kestrel, of course. … and I think it’s pretty plain that he adores her, too. 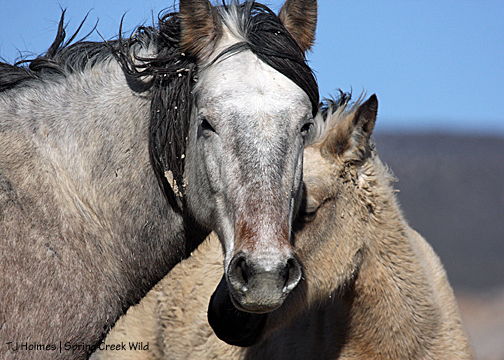 We have such a romantic vision of these horses … mustangs of the Wild West … How they’re portrayed in novels, in Hollywood movies … Reality is far more powerful, I think. In all their muddy-from-snowmelt glory … this is how they are. This is the life they lead. What would *they* tell us if they could? These are the phenomenal, close, intimate, beautiful bonds they share. 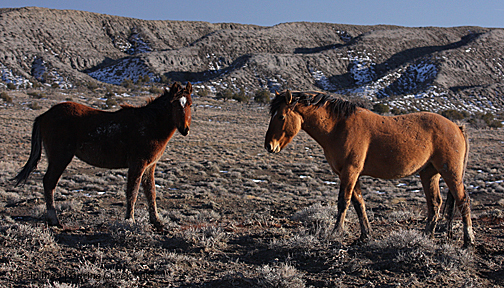 They depend on each other, rely on each other – Kestrel and Winona saw me first, Comanche saw them alert, looked to them, then looked where they looked, saw me a hill away – spend every moment together, eating, napping, playing, fighting, breeding, in curiosity, in fear, in bravery. Their language is richer than we could ever imagine, maybe than we can ever fully comprehend. Much to admire, much to aspire to in their behavior toward each other. We humans have not a fraction of their grace upon this Earth. Response on Saving America’s Mustangs website. 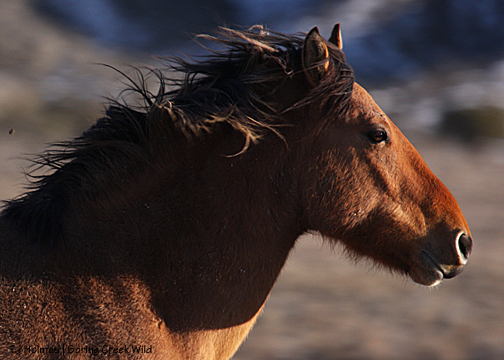 WASHINGTON – The government is going to scale back costly roundups of wild horses that some critics contend are inhumane. 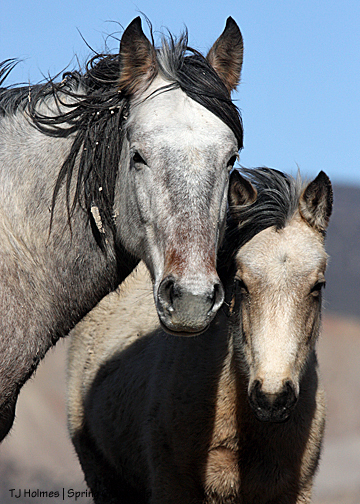 The Bureau of Land Management will reduce the number of wild horses removed from the range by about one-quarter – to 7,600 per year. The agency also will expand the use of fertility control and increase the number of animals adopted by individuals or groups. 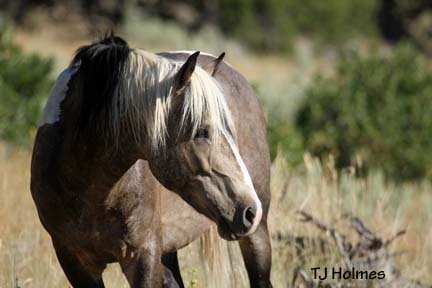 The agency continues to oppose horse slaughter, which some in the West have advocated as a way to thin herds. 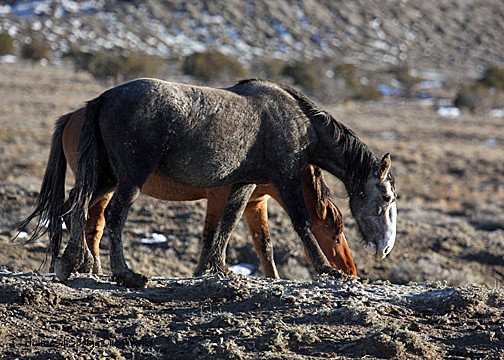 The agency’s director, Bob Abbey, said the new plan was intended to ensure that viable herds of wild horses and burros remain on the nation’s public lands for generations to come. 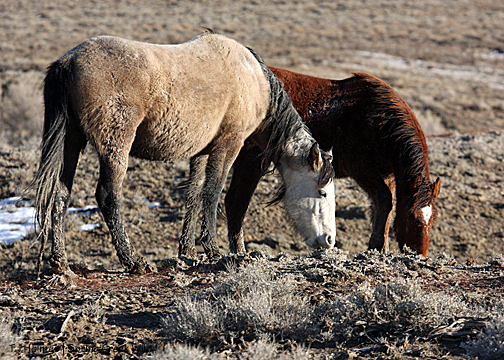 To improve the health of both horses and Western lands, officials need the help of private partners and must ensure that management decisions have a scientific foundation, Abbey said. 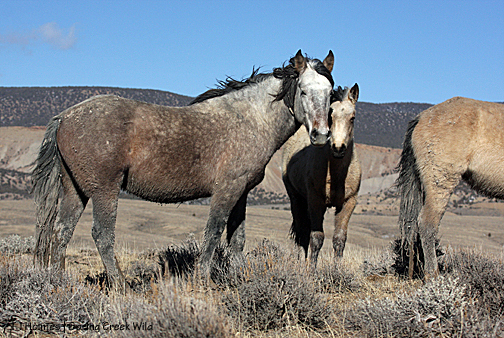 The changes do not include a proposal that Abbey and Interior Secretary Ken Salazar floated in late 2009 to move thousands of wild horses to preserves in the Midwest and East, where they would graze on land unthreatened by drought and wildfires. The government would have established large horse ranches open to the public for tours and educational visits. The preserves would have cost at least $92 million to buy and build. The plan ran into bipartisan opposition in Congress and among the public. “It was very evident to us that the public did not like that idea, and so we have dropped that from the strategy we are pursuing now,” Abbey told reporters in a conference call. 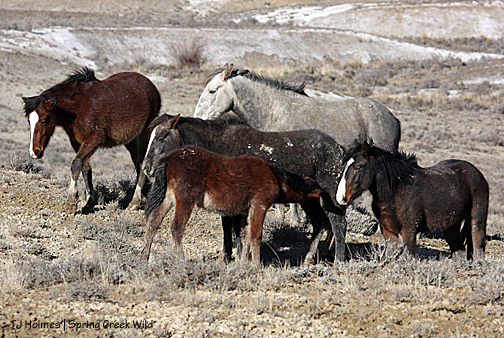 More than 38,000 wild horses and burros roam in Nevada, Colorado, Wyoming and other Western states, the Bureau of Land Management says. An additional 40,000 animals are cared for in corrals and pastures in Kansas, Oklahoma and South Dakota, it says. 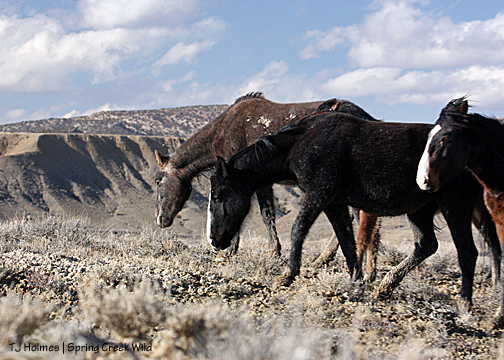 The Wild and Free-Roaming Horses and Burros Act was passed by Congress in 1971. 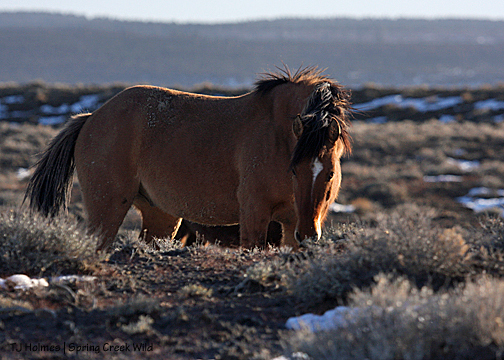 It is intended to protect wild horse herds and the rangelands that support them. Under the program, thousands of horses are forced into holding pens, where many are vaccinated or gelded before being placed for adoption or sent to long-term holding facilities in the Midwest. 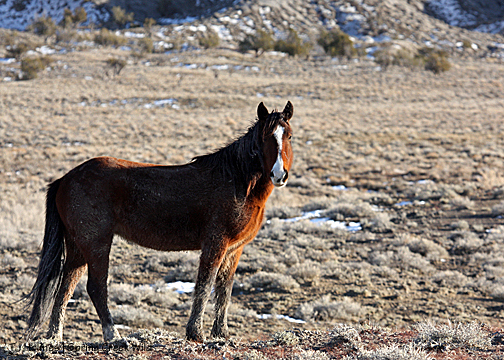 Animal-rights advocates complain that the roundups – which include the use of helicopters – are inhumane because some animals are traumatized, injured or killed. 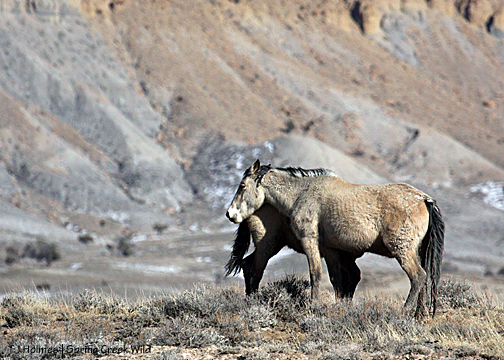 Ranchers and other groups say the roundups are needed to protect fragile grazing lands that are used by cattle, bighorn sheep and other wildlife. 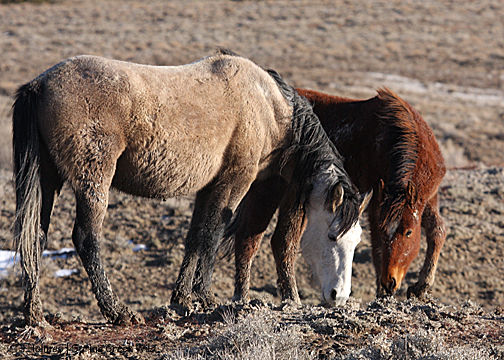 Wayne Pacelle, president of the Humane Society of the United States, called the latest plan encouraging but said the Obama administration needs to do more to reduce the number of horses rounded up and removed from public lands. The current plan “is not economically sustainable, and it is bad policy,” Pacelle said. There has been a lot of talk lately about the upcoming BLM budget process, initiated (I think?) by Rep. Dan Burton’s address in the U.S. House a few weeks ago. It’s a complicated issue, and it’s going to be more complicated when I tell you what it means to Spring Creek Basin. 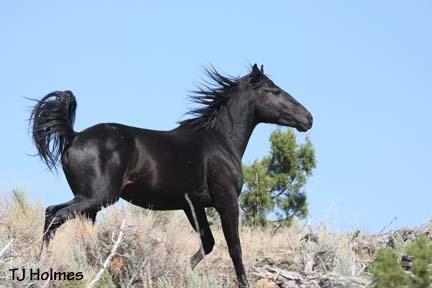 If BLM doesn’t get funding, our roundup this fall won’t happen. Now I don’t quite understand the government budget/funding cycle, and when our roundup was scheduled last year – last budget cycle? – I don’t understand why it’s not funded in this current budget cycle. 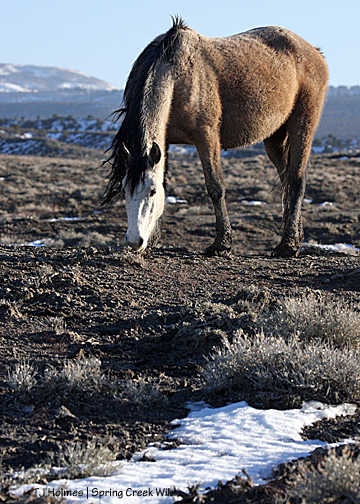 But our district ranger, acting as herd area manager until one replaces our retired manager, just told me that if Congress does not pass a budget for 2011 and passes only a continuing resolution for the remainder of the year, we would not have the funding for a roundup. So here it is: Denial of this budget will have a local impact: It will cancel our roundup. Devastating? Maybe not (?). A huge setback? Absolutely. Why am I so excited about LBC’s roundup this year being canceled and so adamant that ours go on as planned? Because LBC’s was canceled BECAUSE PZP has limited the population growth there. Ours is growing – still growing – and we don’t have a PZP program in place to begin to approach LBC’s success! We’ll end up with about 90-95 horses this year … which would mean ~128 horses next year (based on my knowledge of the horses). 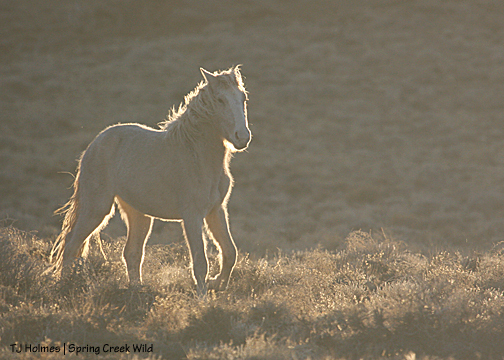 Spring Creek Basin is a drop in the Wild Horse & Burro Program. 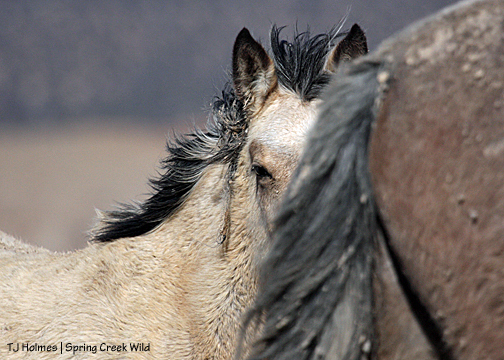 But consider this: In the proposal I wrote last year asking BLM to implement an annual PZP darting program in Spring Creek Basin, I calculated that horses from Spring Creek Basin NOT sent to long-term holding would save the government (taxpayers) at least $2.25 million over their lifetimes in holding (at $20,000 per horse’s lifetime, according to Tom Gorey; it’s $2,500 per horse per year according to Rep. Burton’s address). 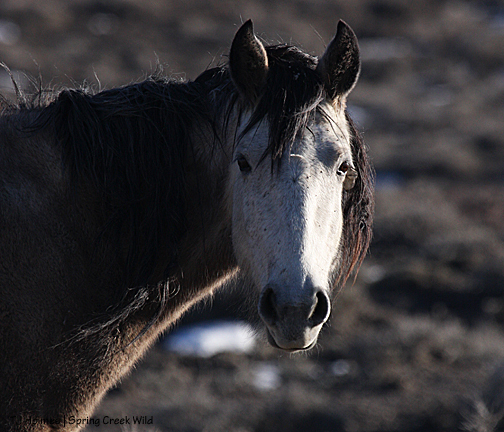 We can achieve that with PZP to limit Spring Creek Basin’s herd population growth, to limit roundups to one per decade rather than three per decade. Yes, we’re a drop in the program – and that’s lifetime, not per year. 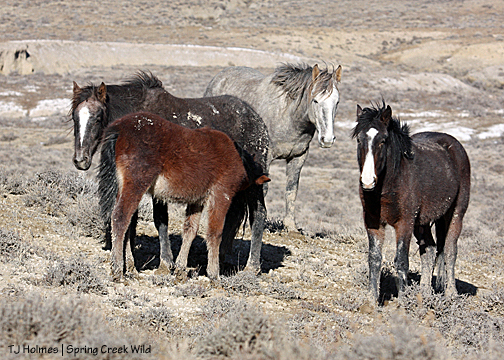 But what if this was the tale in multiple herd management areas and wild horse ranges … Little Book Cliffs, Pryor Mountain, McCullough Peaks, Spring Creek Basin and more? How many $millions ($billions over the long term?) 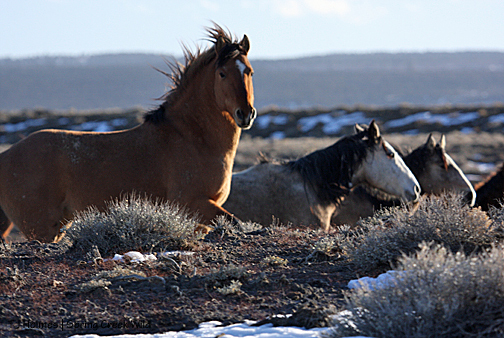 would BLM – the government – taxpayers save? How many horses would we save? 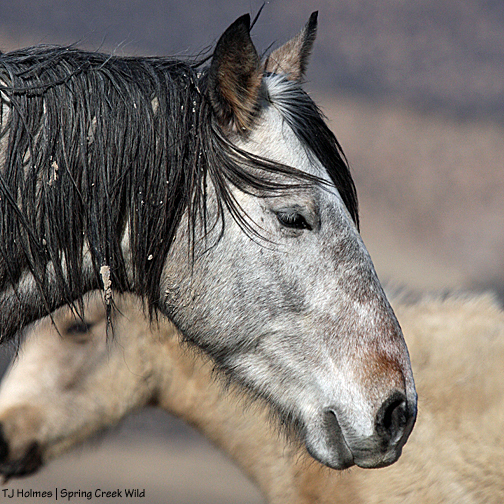 How many not-born mustangs would NOT go to long-term holding … how many mustangs would live wild on their home ranges? So how do I/we comment on the budget process? What comment makes the most (realistic) impact? What comment funds our necessary roundup (see the numbers and reasoning above) and implements an annual fertility program in Spring Creek Basin – to start us on the road to the success seen by Little Book Cliffs? 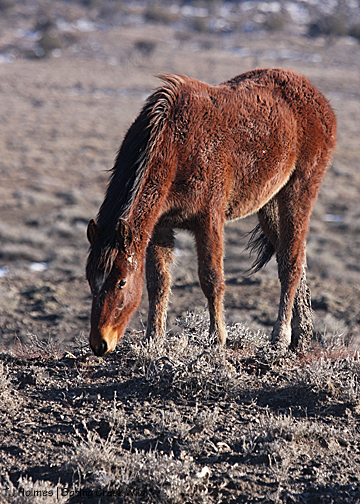 Stopping traumatic roundups is a good goal, but SOMETHING has to be in place to then limit reproduction … leading to what BLM deems “excess.” Wait … what BLM deems? The monsters, right? Re-read what I wrote above: Spring Creek Basin is FENCED. Its resources are LIMITED. 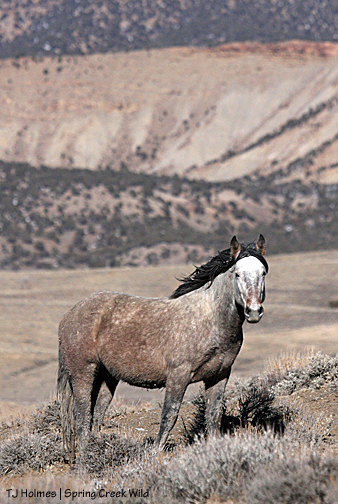 In addition to mustangs, it supports – in limited, seasonal quantities – mule deer, elk, pronghorn antelope and cattle (yes, a limited number of cattle, for three months of the year when water – as snow – is (usually) plentiful), as well as coyotes, black bears, mountain lions (rare, I have seen a track), ravens, eagles (golden and bald), owls, kestrels, bluebirds – others – badgers (caught by my wildlife cam!) … What does that have to do with BLM? Monstrosity? No. That’s simply the law of reality … of nature (as fenced by man, which simply ain’t gonna change). “Let nature take its course …” Who has seen nature in her course? Fortunately (!! 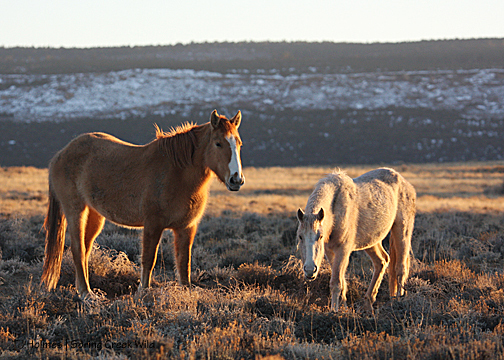 ), Bones and her half-born foal are the only end-of-nature bodies I’ve seen (equine, that is). 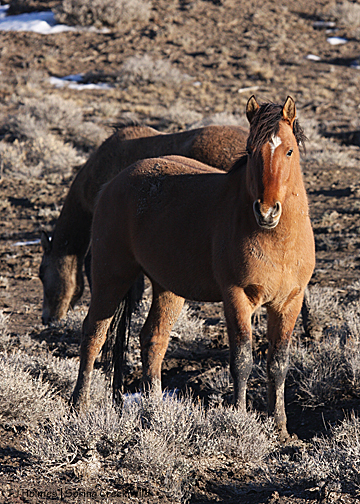 Since I’ve been documenting the horses, I don’t know the causes of the foal mortalities (other than Bones’ foal), and the mares other than Bones and one mare that likely died of a catastrophic injury have been elderly girls. 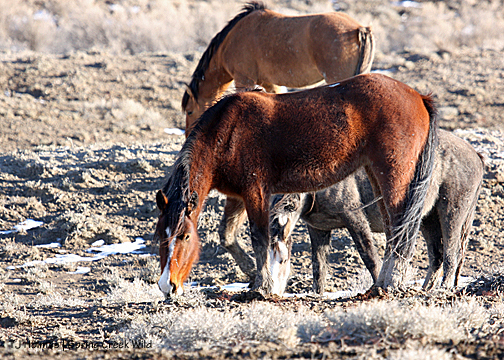 Fortunately, I haven’t witnessed Spring Creek Basin horses at the brink of (or past) starvation – but I’ve heard firsthand accounts from people who have. 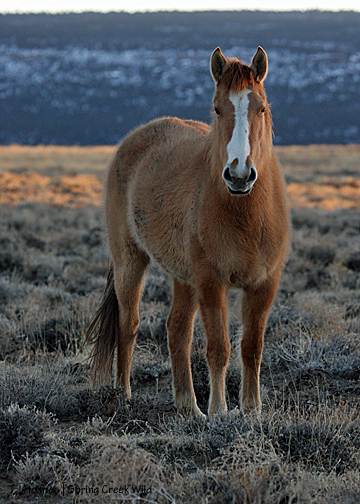 I can’t stand by and watch nature take its course on a fenced range with otherwise healthy horses, and BLM is legally obligated to disallow starvation. Is (lack of) funding going to stop that process? LBC’s roundup was canceled because growth stopped. 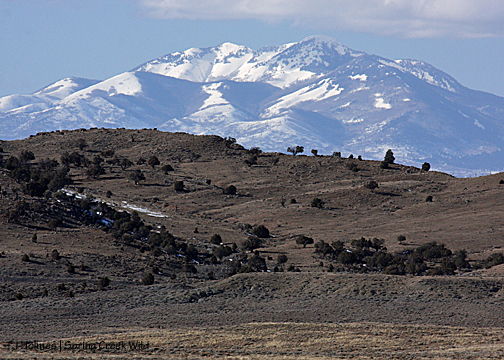 Spring Creek Basin’s population is still growing. On how many other ranges is this the story? I don’t know, I know it only here. 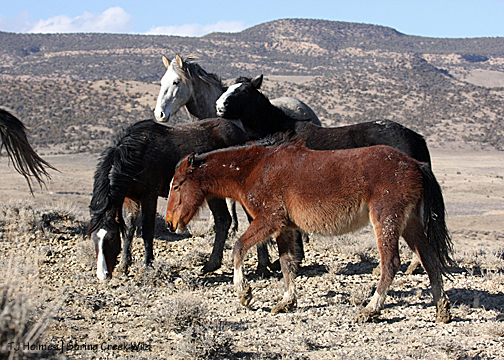 I want the bulk of BLM’s Wild Horse & Burro Program budget to go to managing mustangs in the wild. 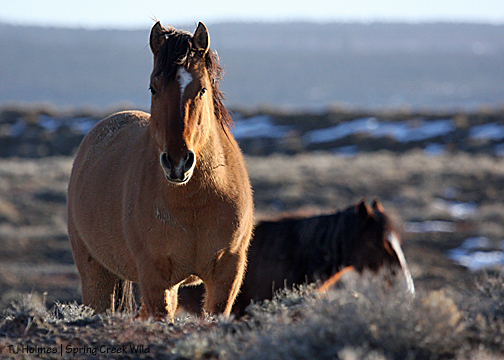 That’s a better goal than “stop the roundups.” In our case, PZP will cost a few hundred dollars a year because of our small population and small number of mares. 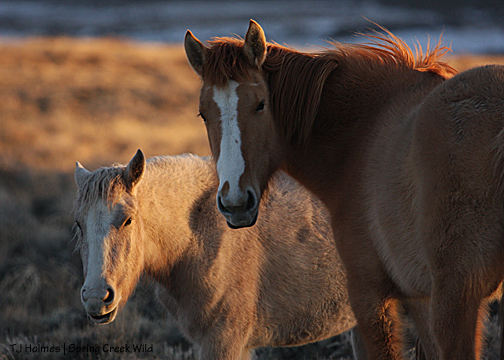 How much better would it be if the bulk of the budget BLM gets for managing wild horses went to fertility control and a smaller amount – because of fewer necessary? – went to roundups and removals? Will we eliminate mustangs in long-term holding? I don’t know … but as at least a short-term goal, wouldn’t it be better to have more horses wild than in any kind of holding at all – as opposed to the other way around? 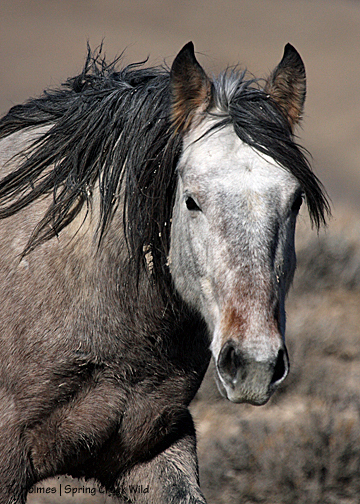 To save the majority – here – some horses must be removed. That’s the end result of current management. If we can then start better management, hoorah! I wish there was a neat way to wrap up this package, this issue, this post. I’ve been trying to get there the last several paragraphs. 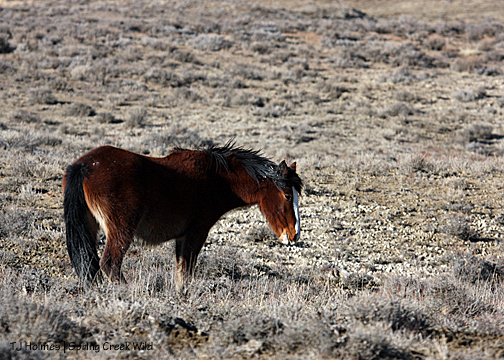 But it reflects the realities of wild horse management. There’s not a neat way to wrap it up. PZP isn’t perfect. Is it better than the roundup/remove option? Obviously, that’s my stand. So our roundup is scheduled for Sept. 17-21 this fall. Little Book Cliffs, which had its last roundup less than a month after ours in 2007, was scheduled for a roundup Sept. 17-21 this fall. Read carefully: The Little Book Cliffs roundup this fall has been canceled. Now ask “why?” – and why am I doing a victory dance – not to mention the folks associated with the Little Book Cliffs herd?! This will be the ninth (I’m pretty sure?) 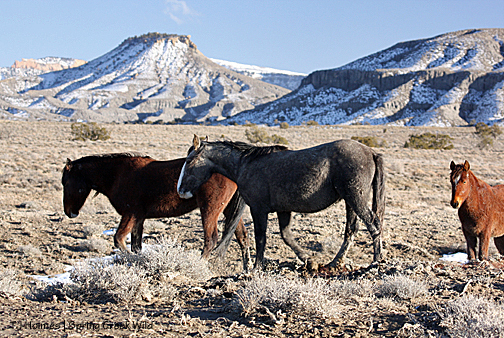 year Little Book Cliffs has administered native PZP to its mares, limiting births. There’s been no herd population growth since last year because of limited births and natural mortality. No change (particularly negative) in range condition. 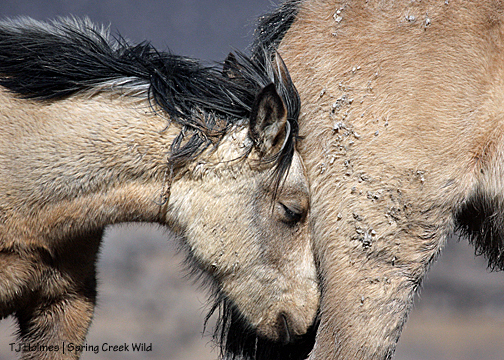 This is on-the-ground success toward a future that saves our mustangs. This is what saves BLM tight funds. 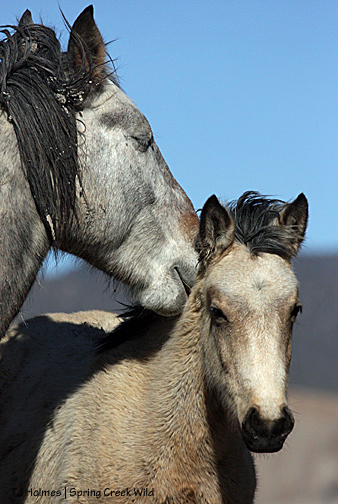 This is how the proposed cut to BLM’s budget might affect future management: Stop spending massive amounts of money to round up and remove mustangs from the wild and warehousing them in corrals and Midwest pastures, and put a relatively low dollar amount toward fertility control to keep more horses in their wild Western homes. Little Book Cliffs doesn’t get the massive press of some other ranges. Why? 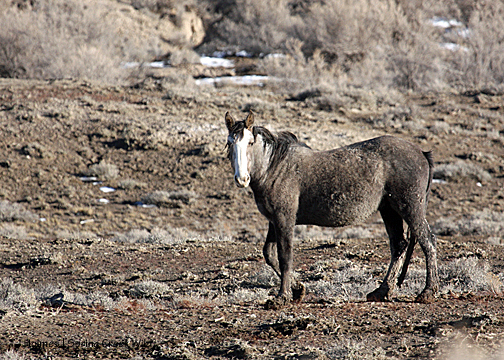 Mutually respectful BLM-volunteer partnership? Lack of controversy? Public education? However quietly on the public scale, Little Book Cliff’s fertility control program has progressed from being a plan, a hope, an expectation and has become a success. Roundup canceled (because of lack of population growth). Isn’t that what we’re working toward? That’s what we’re working toward. Congratulations, Little Book Cliffs! Keep doing what you’re doing! Life got in the way of me posting yesterday (though I started one), so I didn’t quite make good on my promise to post every day for a week. The snow-weather that prevented weekend visits has given way to warm and wet (melting) weather now, so a visit to the basin this week may not be in my cards. The good news is I have a lot more photos from last week’s visit! Here are some random images from the day that don’t necessarily fit into a “category” … they just are as they are. Tenaz checks out some tasty morsel mama Piedra seems to have found. Kestrel protested mildly, but Winona finally got her way. 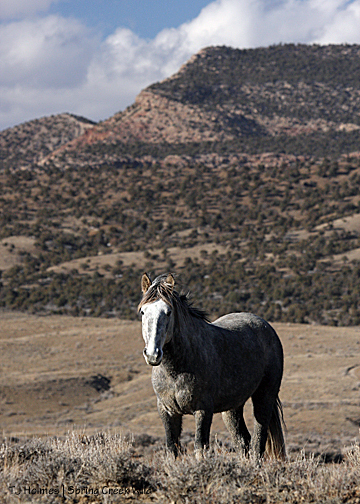 Comanche – Kestrel and Winona were just up the hill to the right. What a … stud! 🙂 Isn’t he just wonderfully handsome? Scenery interlude: All the near foreground is within Spring Creek Basin. 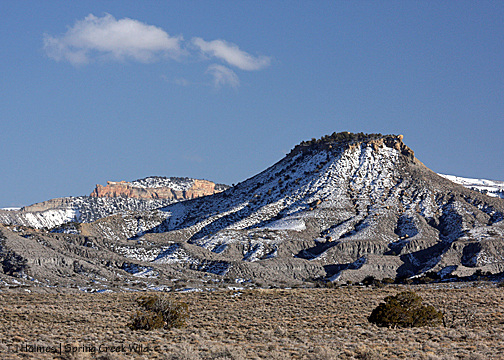 The La Sal Mountains in the background are in Utah. What caught my eye was that through-the-clouds spotlight on the mountains. A long lens is essential for photographing wildlife, and it’s also perfect for isolating parts of landscapes. 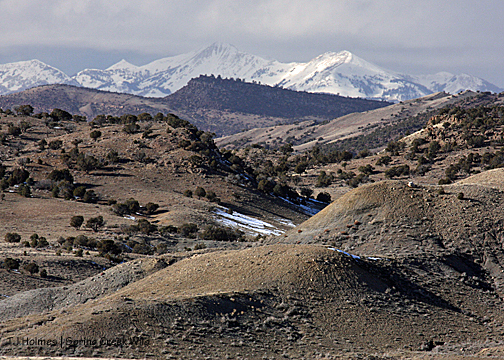 The first two “layers” in the foreground are in Spring Creek Basin – the hills in front and the hills rising up behind. Then the next couple of layers are outside the basin, in Disappointment Valley. And the mountains beyond. The entire foreground here is Spring Creek Basin. 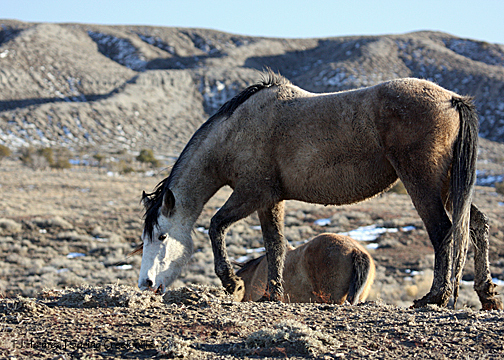 Fierro catches a snack surrounded by family – Sable just out of sight to the right. That ol’ sun was on its eveningly trek when I started floating out of the basin, happy, exhausted, grin plastered across my face … I had looked some for Kreacher’s band because I had seen them at the base of Filly Peak from the corral hill the day before, and I was sure they were in the area, maybe on the backside of Filly, where they were the day I spotted them with Corona reunited. My absolute first rule of visiting the basin is “no agenda.” I learned very early on that I can’t go out with an agenda of seeing so-and-so or such-and-such or even getting to such-a-place … because something WILL come up and change whatever “plans” I made. For better (mostly) or “worse” (rarely), the best thing you can do is go with an open mind and open plans to ENJOY. Enjoy whatever comes up or along, enjoy whoever appears for a visit. When I first arrived, I spotted Chrome’s out on corral hill, right at the top where the trail comes up, and I thought, “I’ll have another quick look here, then I’ll zoom over there and hike up and have a visit with those ponies.” And then I spotted backs – Hollywood’s back, Kestrel’s and Winona’s backs (though I didn’t know it right then) – and that zoom-around never happened. Luckily for me. Having no agenda, no plan, no expectations, results in true enjoyment, I think. (Though I will say that, even with no expectation of what would or might happen Wednesday, I was rather disappointed … which I’m sure contributed to Thursday’s WOW visit!) It has worked for me, in any case. And so, when I was slowing dragging myself out of the basin for the drive home, not wanting to leave, reflecting on the day, the horses, the visits, the light, the wind like the breath of life, the struggle against the mud, the euphoria … when I saw Kreach up at the bend, I just had to stop a minute. When I wasn’t looking, there they were. Corona had just “spooked” at something on the ground and hopped straight up and sideways. I wish I’d caught her in mid-hop! Don’t you love that exquisite halo of light? She had just finished nipping at Kootenai in a most unladylike way – which Koot took perfectly in stride. I just couldn’t get over that divine light on their fuzzy coats. It goes so quickly, that light … but there’s still a whisper of it remaining … Corona seems to be checking out mama’s belly, but what she’s really doing is pressing mama’s willingness to let her nurse – which is nil, according to mama, who continued on after Kreacher in the next moment. Basic rule: Follow the horses’ lead – live in “the moment.” Those moments, however fleeting, are gorgeous.